Delicious homemade Hawaiian Sweet Rolls, soft, fluffy and fresh from the oven. These Hawaiian sweet rolls have a tropical flavor perfect for breakfast, lunch or dinner. My love for baking goes back a long time ago. Since I was a little kid really. Which is interesting because my mom was not a baker nor did she really like to bake, but the times that she did, I was right there in the kitchen with her, excited and eager to learn. It’s a passion I’ve had forever. Although I’m not a fancy baker, or a pastry baker, I do love to bake breads, muffins, scones, cookies and cakes. So needless to say, I would never in a million years turn down a dinner roll recipe. 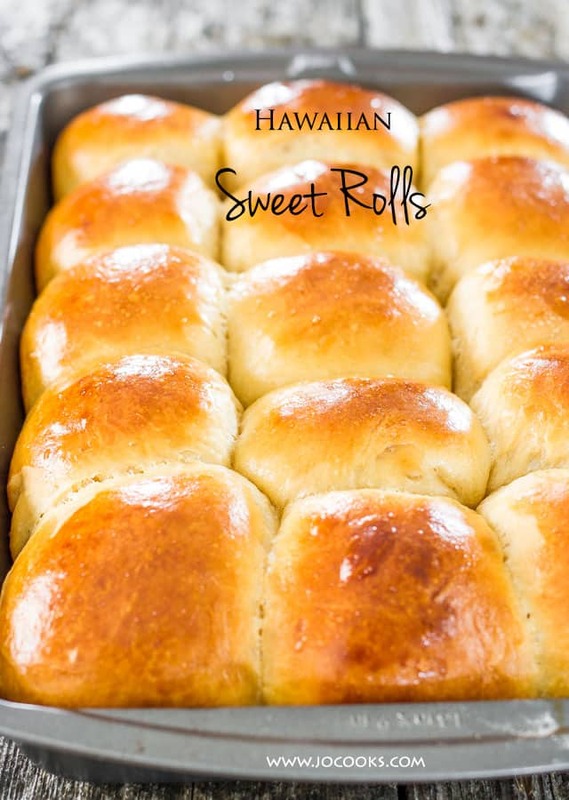 These Hawaiian sweet rolls are one of my favorite rolls. It’s an old recipe I’ve shared with you back in 2014 and wanted to share it with you again with some new pictures, a video and a bit more explanation regarding the dough. The reason I started making my own Hawaiian sweet rolls is because I can’t find them here in Calgary and eventually I gave up looking for them and decided to make my own. I’m so glad I did because they really are one of the best rolls ever. 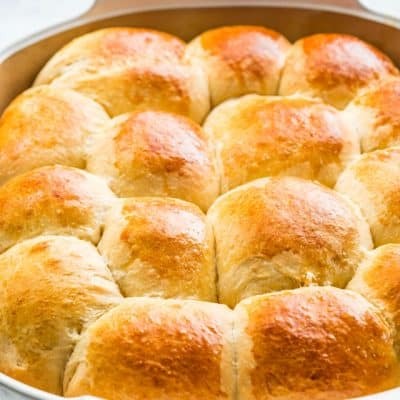 You may think that a dinner roll is just a dinner roll. But if you look at the list of ingredients, you’ll notice pineapple juice, coconut extract and ginger which are not too common in bread rolls. At least not in the rolls I’ve made before. Needless to say, these sweet rolls are delicious and have great tropical flavors. The rolls are perfect for sandwiches, which is actually how we ate them. Ham and swiss cheese sandwiches, placed them in the oven for a few minutes just until the swiss cheese melted and OMG were these sandwiches delicious. But they’re perfect for breakfast with some jam and butter, or eggs, whatever you want. 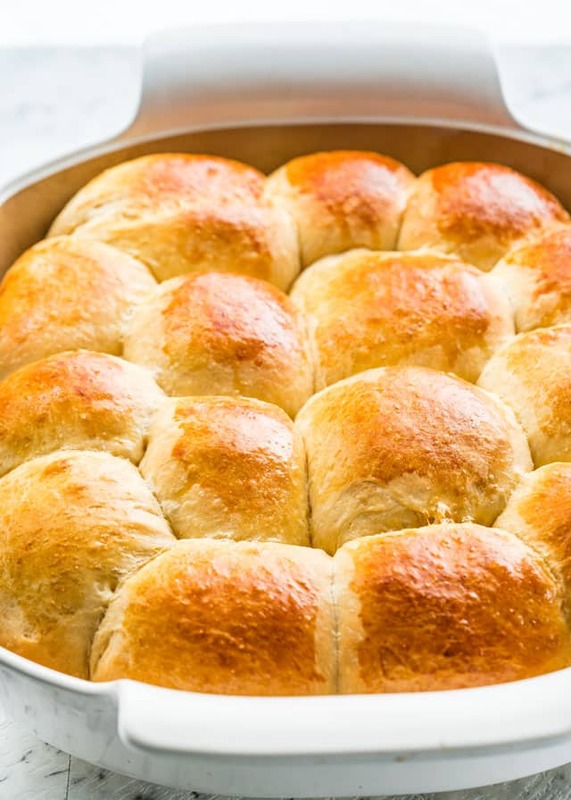 They are a bit sweeter but they are super soft and fluffy, and honestly, there’s nothing better than hot fresh rolls right out of the oven. 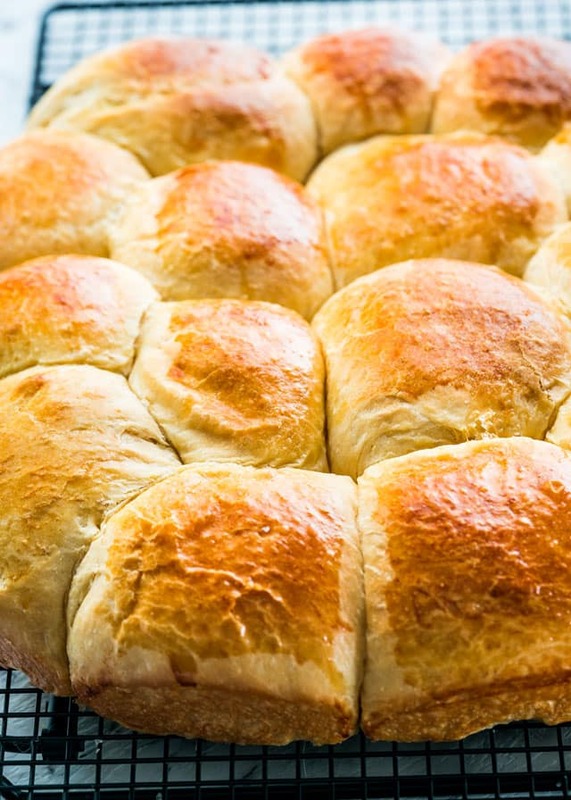 I especially love the buttery smell of my Crescent Dinner Rolls! It’s right up there with bacon, in my book. Not sure which is higher. Maybe hot rolls and bread because I love the smell of hot bread, but then I love the smell of bacon too. OK, we’ll leave this debate for a later time. But I’ll probably be thinking of this all night. When I originally posted this some of you had issues with the dough saying that the dough is too soft or sticky. The dough is supposed to be a soft sticky dough. I didn’t even use the full 4 cups of flour. However, there are many factors that come into play when it comes to making the right dough. Usually though when you have a sticky or runny dough, the more you knead it the less sticky it becomes and eventually it will become glossy and develop a skin as the gluten forms. But this dough is supposed to be quite soft to the touch, but as you mix it in your mixer it should still come clean off the sides of the bowl. The other issue some people have is with their dough not rising. Pretty much this always has to do with your yeast. In this recipe I’m using instant yeast and not active dry yeast though you could use either. The difference is that instant yeast does not have to be activated, just add it to your dry ingredients, where as with active dry yeast you have to dissolve it in a bit of warm water first. Totally up to you which you use. But always always check the expiration date. Check out the recipe notes for more information. In a medium size bowl, combine the melted butter, buttermilk, pineapple juice and brown sugar. Slightly whisk so that it's all combined. Wait a bit until mixture cools a bit (if it's too warm from the melted butter) then add the extracts. Meanwhile, in the bowl of your mixer, combine 3 3/4 cups of flour, yeast, salt and ground ginger. Using the paddle attachment, turn the mixing speed on low and slowly pour in the wet ingredients. Continue mixing while adding the 2 eggs and egg yolk. A sticky dough will begin to form. Switch to the hook attachment and knead the dough for 7-8 minutes, adding 1/4 cup more of flour if necessary. Do note that this is a very sticky dough, so don't add any more than 4 cups of flour total! 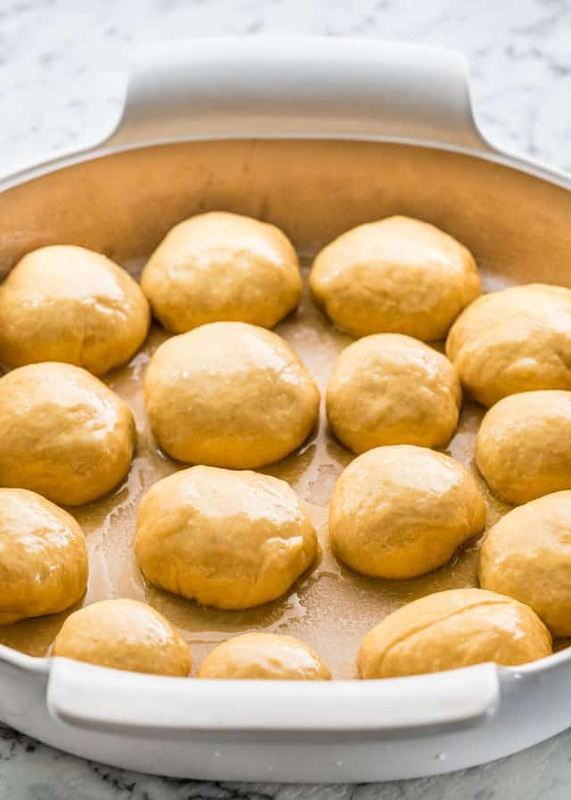 Once the dough has been kneaded, form into a ball and place in a large metal or glass bowl that has been lightly greased. Cover with a clean towel or plastic wrap, turn OFF your oven, place inside and allow to rise for about 1 to 1 1/2 hours or until doubled in size. I use this trick all the time to speed up the rising time. Once the dough has doubled, remove and gently deflate. Divide into 15 equal pieces. Roll into circles and place in a parchment lined 9x13 pan. Heat oven to 200 degrees. Generously butter the tops and sides of each roll. Place a clean kitchen towel over top. Turn OFF your oven and place the covered rolls inside to rise until doubled in size. Brush the rolls with egg. 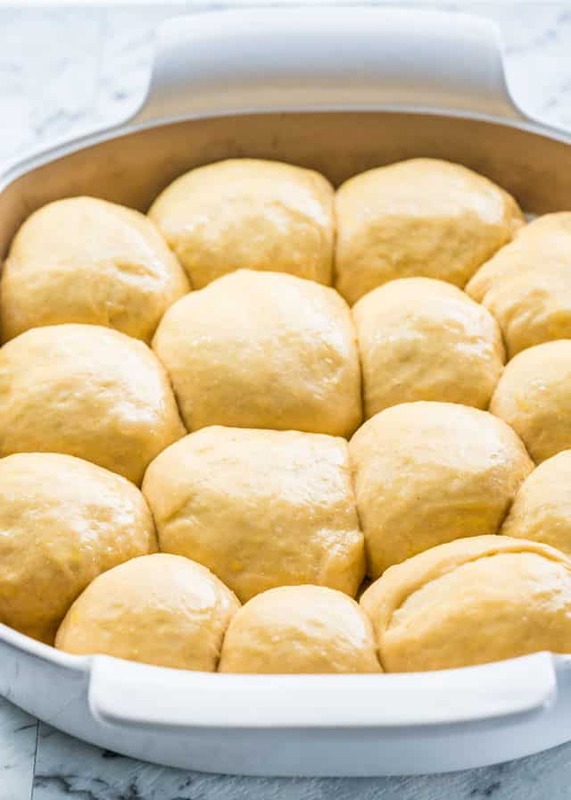 Once heated, bake the rolls for 22-25 minutes or until the tops are golden brown in color. This is a very soft and somewhat sticky dough. Keep mixing/kneading the dough until it comes clean from the sides of the bowl, but you should not have to add more flour than the 4 cups. If using active dry yeast, please make sure you activate it first by dissolving it in a bit of warm water. If it does not begin to froth up, do not continue with the recipe. I don’t have a mixer or bread machine. I have a regular old fashion hand mixer (no paddles). Can I use that or just mix by hand? You’ll have to knead by hand! Knead everything together until the dough is nice, soft, and elastic. If you have a kneading function, then yes! i made the sweet roll today. It turned out perfect,and sooooo..good. We love it..Thank you for the recipe!! This NC baker is in th process of making this recipe as we love Hawaiian Sweet Rolls, buy them always! 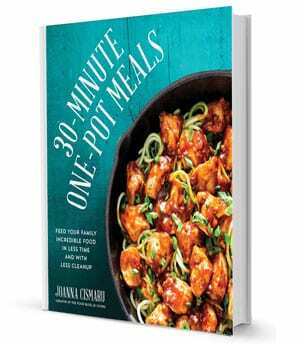 As I make most of my bread, gave this a go. The dough worked beautifully! Flour amount was perfect! It did not raise in warmed oven after 1 hour?! Presently, am waiting longer for it to raise double. It sounds like your yeast might be dead! We have some yeast troubleshooting in the note section of the recipe. I would like to send these to a friend is South Carolina I live in NJ. How long can these be left out in a package before it goes bad? Because these rolls are homemade and have no preservatives, their room temp life is about 3 days. They can travel if you over-night them! Could you possibly use this dough for a doughnut by frying? I haven’t tried it myself, but I don’t see why not. I think it would work just great. Can you use this recipe in a bread machine? If you’d like to make it into a loaf instead of rolls, then yes for sure! It tastes great but mine came out looking more like corn bread consistency (more cakey) instead of a nice dinner roll consistency. Not sure what went wrong. That’s very interesting, ours came out incredibly soft. So, they came out dense? That could be one of two issues. Either too much flour (if you added any extra) or your yeast wasn’t good. Did the dough rise significantly like shown in the video? If not, then you need a new jar of yeast. I suggest storing it in the freezer so it lasts longer. It rose very well so don’t think it was the yeast. I only added a tiny more flour mainly when forming the balls as it was very sticky and just stuck to my hands. My balls didn’t completely hold their shape either and kind of “melted” some in the pan before baking. I don’t remember my dough pulling away from the walls of the mixer like in the video. I’m thinking there wasn’t enough flour in this recipe. I wouldn’t say mine was dense like cornbread but it had more of a consistency of a cake (somewhat crumbly but not entirely). If you use regular milk add 1 tsp of either white vinegar or lemon juice to the milk. Don’t worry if it curdles. Just use an even tbsp, that will do the trick. I need gluten free. 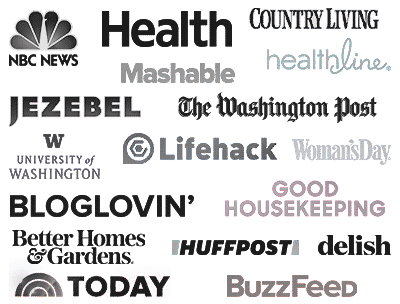 Can I substitute gluten free flour? If you use gluten free flour, you’ll have to use zanthan gum to replace the gluten proteins.